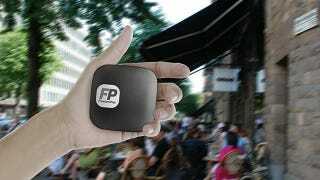 As the world's smallest 4G mobile WiFi hotspot, the FreedomPop Photon fits in the palm of your hand and simultaneously provides up to 8 of your devices with 12mbps download speeds. Kotaku readers can grab a feature-rich starter package that includes the Photon and 2GB of data today for a low $39.99. FreedomPop, the company that makes data plans available to just about everyone, has been a favorite of ours for quite some time. They offered the first free wireless plan and offer a really cool home-based hub with 4G speeds and data too. FreedomPop makes some pretty awesome hotspots and routers with free data, and the Photon does not disappoint. With 6+ hours of battery life and 2GB of cheap data, you can do your work privately and securely from just about anywhere. But it gets more interesting: subsequent months of 2GB of data cost $18, yet you can drop down to 500MB at will and pay absolutely nothing; the 500MB basic plan is completely free. FreedomPop also has a generous affiliate program that offers 50MB for every friend you refer and for participating in various programs, similar to the way Dropbox allows you to increase your storage permanently at no charge. (And for those doing the math, subtract the data cost and you're only paying $22 for the Photon itself. The fact that you can choose to remove the monthly data charge at your discretion makes the barrier to entry here practically nonexistent.) Learn more at FreedomPop and let us know how you like it.